What Are the Phases of Addiction? There is sometimes a perception that addiction is something that either exists in a person’s character or does not. This idea can lead to a belief that a person who is struggling with addiction to a substance may have had one drink or tried an illicit drug one time and immediately became addicted. However, the reality is a bit more complex than that. As defined by the American Society of Addiction Medicine, addiction is a chronic brain disease that affects the brain’s reward, pleasure, memory, and motivation. Like many chronic diseases, it does not just spring up one day. Often, several circumstances line up that, over time, cause a person who would otherwise enjoy casual drinking or avoid substance abuse to become addicted to drugs or alcohol. The process of developing addiction in this case tends to occur over a series of stages and, like other chronic illnesses, often turns into a cycle of addiction, treatment or abstinence, and relapse. The multiple stages of addiction can occur over a short period of time, or they can take months or even years to develop. A person who has only occasionally had a casual drink may, over years, develop a habit that can turn to alcoholism. Sometimes, these stages may occur simultaneously. As an example, for illicit substances used to feel a “high,” even one use is considered to be abuse. Some of these illicit substances can also result in tolerance within one or two uses. Nevertheless, in the majority of cases, all of these steps are part of the chronic cycle of addiction. There are many reasons that the individual who ends up struggling with an addiction might try the substance to start with. It can be as seemingly benign as getting a prescription to manage pain or a mental health issue, as culturally typical as trying a first drink at the age of 21, or as insidious as being pressured by friends or family to try illicit drugs. Regardless of how the initial use occurs, it is the first step toward addiction. Nevertheless, even these risk factors won’t necessarily lead to the high-risk individual developing a substance use disorder like addiction. Other contributing factors often factor in, including the subsequent stages of addiction. The next stage of the addiction cycle is substance abuse. This is the point at which the person is using the substance on a recurring, improper basis; more simply, the World Health Organization simply defines substance abuse as using a substance in a way that is harmful. Perhaps the individual who is taking a prescription painkiller decides to take higher doses or use the medication more frequently. Another example is the person who engages in regular binge drinking or who occasionally uses cocaine. Whether or not a substance is being abused often depends on the substance itself and how it acts on the body. As described above, with illicit drugs like heroin or methamphetamine, abuse occurs the first time a person uses the drug. With legal substances like tobacco or alcohol, or with prescription medications, abuse is a little harder to delineate, but it is often defined as the point where the person is using the substance for the euphoric response, or high, that the drug creates, rather than for the social or treatment aspect of the substance. In some cases, substance abuse first occurs if the person is using the drug to self-treat mental or physical issues without the advice of a doctor. When a person has been using a prescription drug or abusing other substances over a long period of time, the substance can cause changes in the brain that result in tolerance – a condition described by Merck Manuals as one in which the original dosage or use of the substance no longer produces the same physical or mental effect. As a result, the person using the substance may increase the dosage or frequency of use to try to recapture the original result. For a while, this might work. Then, over time, tolerance to this new dosage occurs, and the person increases again, creating a progression into heavy substance abuse. 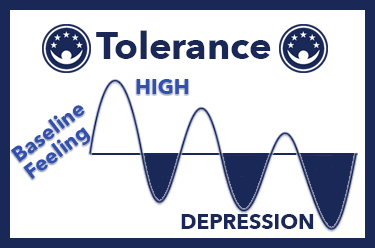 Tolerance is an indication that the brain has changed in response to the drug. For methamphetamine or other stimulants, this could include the loss of certain brain chemical receptors or a decrease in brain chemical production. Slowly, the person’s brain adjusts and changes how it responds to the presence of the drug. This, over time, will lead to the next stage in the addiction cycle: dependence. At a certain point, the body or brain becomes dependent on having the substance to be able to function properly. As an example, a person who has been using cocaine or meth for a long time may find it impossible to feel pleasure without the drug – a condition called anhedonia. 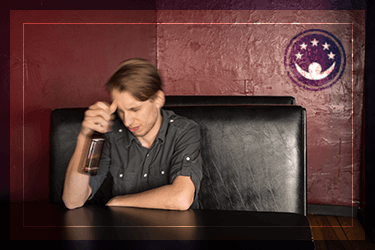 Not all drug dependence is addiction, as explained by the National Institute on Drug Abuse. For example, a person with chronic asthma may be dependent on a daily medication in order for that person to be able to breathe properly. However, this is not addiction. In this case, the body was not working properly before the drug was introduced, and the individual is using the medication to correct that function; the drug does not cause the dysfunction. However, if the person has been using a drug to treat another condition, and becomes dependent on that drug to feel good separate from the condition being treated, it may be a type of dependence that leads to addiction. In general, experiencing 2-3 of these symptoms is considered a mild substance use disorder. Reporting 4-5 of them leads to diagnosis of a moderate disorder. If the person is experiencing 6 or more of the symptoms, it is considered to indicate a severe substance use disorder, or addiction. A hallmark of any chronic condition is the potential for the person to relapse. In chronic conditions like diabetes or asthma, relapse is often expected as the individual and medical personnel work together to determine the treatment that makes it possible to manage the condition. Addiction is no different from these conditions. In fact, relapse rates for addiction – at 40-60 percent – are similar to those for asthma (50-70 percent) and adult-onset diabetes (30-50 percent), as reported by the National Institute on Drug Abuse. Sometimes, the initial treatment is not quite right, or the person starts by trying to quit without help, and over time, control is lost and the person relapses to drug use. However, this is not an indication that the person has failed, only that treatment needs to be adjusted. An individual may go through multiple attempts to stop using a substance before realizing that addiction is a factor. However, when addiction is diagnosed, it is possible to interrupt this cycle of addiction, abstinence, and relapse by getting professional treatment that is backed by research showing its ability to help. Multiple methods, including cognitive and behavioral therapies, peer group support, and other physical and mental health treatments can encourage the person to develop tools for managing this chronic, recurring condition. As with the medications and therapies used to treat asthma and diabetes, the treatments in addiction rehab are designed to help the person learn to manage a chronic substance use disorder and reduce the likelihood of relapse to drug use. With motivation and experienced, certified help, these individuals can learn to interrupt the addiction cycle and move forward into the sustained abstinence that heralds recovery and results in a more positive future.